Bring water and sugar to a boil, then reduce to a simmer. Add orange zest, cloves, vanilla, star anise, raisins and pears. Cook on low heat for about 15 minutes or until the pears are fork tender. Remove pears, slice pear quarters once again, place in a baking dish, cover with foil to keep warm. Continue simmering the liquid adding the maple syrup until liquid has thickened. Mix all ingredients above and dip bread slices into mixture and let soak for approximately one minute. Cook on both sides until golden brown. Remove from griddle. 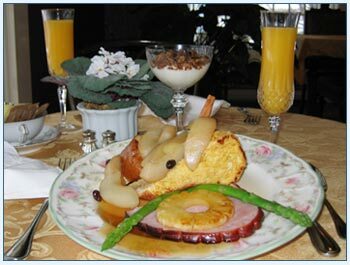 To serve, place French toast on serving plate, top with pear slices, garnish with cinnamon stick and Anise stars. Pour remainder of syrup into containers and place on the table.